On Friday, March 2, 2018, forty-one high school students from around the state will take center stage for three rounds of poetry recitation and the chance to be named Michigan’s 2018 Poetry Out Loud Champion. The competition, free and open to the public, will be held at the Lansing Crowne Plaza, 925 S. Creyts Rd, Lansing, MI 48917, from 9 a.m. to 4 p.m. 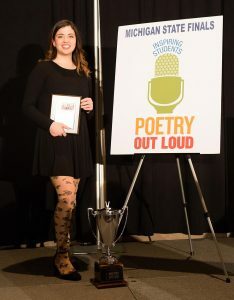 The awards ceremony will begin at 3:30 p.m.
Forty-six Michigan high schools challenged their students to learn about great poetry while building their public speaking skills in Poetry Out Loud, a national poetry recitation competition for high school students. At the state competition, 41 school champions will compete in three rounds of recitation for the chance to be named this year’s state champion. The state champion receives a $1200 cash award, $1500 stipend for his or her school, and an all-expenses-paid trip to Washington, D.C. to represent Michigan at the national competition this April 23-25. The first runner-up will receive $600, with $700 for his or her school. The second runner-up will receive $200, with $200 for his or her school. The third runner-up will receive $100, with $100 for his or her school. Student and school prizes at the state level are funded by the National Endowment for the Arts and the Liesel Litzenburger Meijer Fund. Participating students represent new and returning school partners across Michigan; many are traveling to Lansing from Greater Detroit, Midland, Grand Rapids, the Leelanau Peninsula, and Upper Peninsula. In 2017, State Champion MaryKate Wright was the school champion from Owosso High School in Shiawassee County. MaryKate went on to represent Michigan in Washington D.C.
We are very excited to welcome educator and writer Peter Markus, poet and professor Cindy Hunter Morgan, and Detroit non-profit InsideOut Literary Arts to the Michigan competition this year. Markus and Morgan will lead poetry workshops for participating students and teachers on Thursday evening. Youth from InsideOut Literary Arts’ Citywide Poets program will perform for the competition audience on March 2 at 2:45 p.m.Poetry Out Loud is a program of the National Endowment for the Arts and Poetry Foundation, and is hosted locally by the Michigan Humanities and Michigan Council for Arts and Cultural Affairs. Support is also provided by the National Endowment for the Humanities and Meijer. Please join us in celebrating the achievement of these students. If interested, interviews with lead teachers or staff at MH may be arranged.